No cords, No batteries, Needs only one candle. 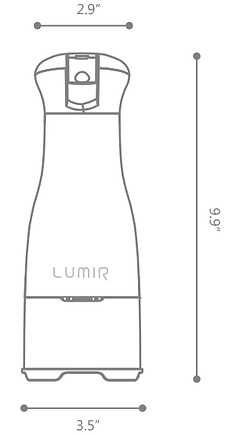 Lumir C is shaped after a lighthouse that lights up a dark sea. Delicate mood of a candle and modern sense of LED are in wonderful harmony. Lumir C is a LED lamp using thermal energy of a candle without any external power supply. Combining the delicate ambience of a candle with modern LED technology, Lumir C provides maximum illumination from a minimum of energy. Like a lighthouse that lights up a dark sea, Lumir C will comfort you with its bright and dependable light. : No battery ; Batteries have been causing severe pollution to environment. But eco-friendly Lumir C doesn't use any batteries so it is free from that problem. : Cordless ; It doesn't need any burden wire or outlets because your candle will make electricity instead. So you can use Lumir C anywhere you want such as in camping, on bedside or while decorating your house if you have just one candle. *Tip : Using your favorite scented candle with Lumir C will make you feel relaxed. We welcome retailers and wholesalers to talk with us for the sales of this innovative and green product. a soft atmosphere by diffusing light all around you. Lumir C Spot provides a directional and adjustable beam of light, helping you do more focused things, like reading your book before bedtime. Lumir C was launched by the beginning of Jul, 2016 in the big department stores in South Korea including Lotte department store, Shinsegae department store (Samsung affiliate). Lumir was at the UN NGO Conference in Gyeongju, Korea. P.S. Photo with 8th Secretary-General of the UN Ki-moon Ban. Lumir C has been featured on French magazine "Science et vie" Take a quick look! Lumir has been featured in the world's leading men's magazine GQ in UK.